My paperpile extension seems to have stopped working properly. When adding a citation in docs, it works as expected. However, i cannot edit the citations as I normally do anymore. The citation appears as a link to a website I do not have access to. And when I try to edit the citation, I cannot add, remove, or change citations in any useful way. Hoping to hear back from you very soon! I have yet to see a case of this where manually restarting the extension does not resolve the issue. Go to More Tools --> Extensions in the Chrome menu, then switch the Paperpile extension off, then on again, then reload your Docs tab. If that still does not work, please contact us via the in-app chat so we can investigate in more detail. W.r.t. 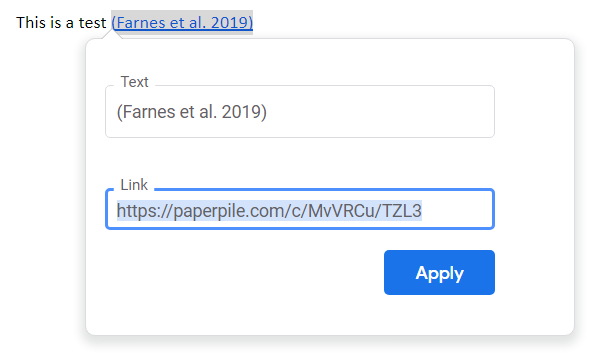 finishing your paper, you can use our sidebar add-on, which works independently of the extension.